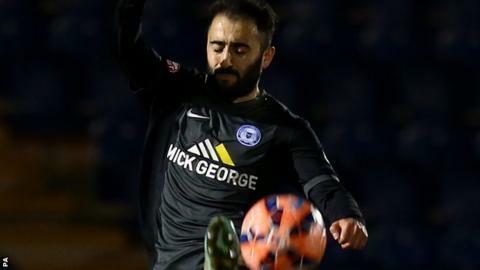 Erhun Oztumer marked his first league start for Peterborough with a brilliant free-kick as they overcame Orient for their first win in seven league games. Posh went ahead early when Aaron Mclean made no mistake from close range. The home side levelled when Sean Batt found space on the edge of the box and beat Ben Alnwick with a low shot. Oztumer spoiled Fabio Liverani's first game as Orient boss when he curled home after Mclean was tripped, and Posh held on despite Joe Newell's late dismissal. The midfielder, whose cross had created Mclean's opener, collected his second yellow card in injury time for a late challenge. Former Italy international Liverani is Orient's fourth manager this season, with Kevin Nugent and Mauro Milanese having short-term spells in charge following Russell Slade's departure for Cardiff in September. The defeat was their third in a row and dropped them into League One's bottom four, with Peterborough remaining ninth despite their victory, but outside the play-off places on goal difference only. "It's been a week where the players can familiarise themselves with their new manager [Liverani] and get to grips with what he's trying to implement. "He is looking at a short passing game and we've been working on that this week. "We're not stepping up to the mark at the moment, and we need to start really kicking on because before we know it the games will have run out." Match ends, Leyton Orient 1, Peterborough United 2. Second Half ends, Leyton Orient 1, Peterborough United 2. Second yellow card to Joe Newell (Peterborough United). Corner, Peterborough United. Conceded by Shane Lowry. Jermaine Anderson (Peterborough United) wins a free kick in the defensive half. Foul by Victor Adeboyejo (Leyton Orient). Attempt missed. Kgosi Ntlhe (Peterborough United) right footed shot from outside the box misses to the right. Attempt saved. Josh Wright (Leyton Orient) right footed shot from outside the box is saved in the centre of the goal. Substitution, Peterborough United. Jermaine Anderson replaces Harry Beautyman. Substitution, Leyton Orient. Victor Adeboyejo replaces Jobi McAnuff. Aaron McLean (Peterborough United) wins a free kick on the left wing. Attempt missed. Erhun Oztumer (Peterborough United) right footed shot from outside the box is just a bit too high from a direct free kick. Scott Cuthbert (Leyton Orient) wins a free kick in the attacking half. Corner, Peterborough United. Conceded by Gary Sawyer. Michael Bostwick (Peterborough United) wins a free kick on the left wing. Substitution, Leyton Orient. Jay Simpson replaces Shaun Batt. Corner, Leyton Orient. Conceded by Christian Burgess. Corner, Leyton Orient. Conceded by Gabriel Zakuani. Attempt blocked. Joe Newell (Peterborough United) right footed shot from the centre of the box is blocked. Attempt missed. Bradley Pritchard (Leyton Orient) right footed shot from outside the box is high and wide to the left. Attempt missed. Harry Beautyman (Peterborough United) right footed shot from the right side of the box is too high.